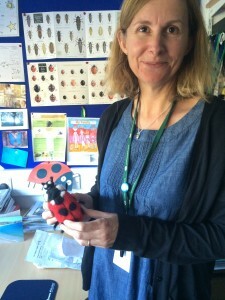 I visited my friend, leading ladybird expert Prof. Helen Roy, today in her Oxfordshire offices. Helen provided much inspiration for my new novel and tons of information and research help into ladybirds and beetles (The Night Visitor is coming out next year, ages away still but I’ve finished it now). Apparently there are Harlequin ladybird swarms going on – it’s ladybird madness across Britain at the moment. The Harlequin is an invasive alien species – they may look cute but they’re the baddies, mainly if you’re a nice British ladybird. Tabloids of course have reported this as ‘swarms of alien bugs carrying sexually transmitted diseases are invading our homes’.